Lady is the Boss – Bicycle fight! Lately I’ve been using my eZtorq to head up to Fitzroy once every week or two. It’s a nice easy route, and faster than any other means at my disposal. Also cheaper, and just generally awesome. It’s almost a shame I don’t need to travel more often but I’m quite happy knowing my carbon footprint is as low as it possibly could be for my daily travel requirements! Carnival of the Green # 109! Happy New Year eBikers, and welcome to the first post of 2008, which is a bit of a change of pace for the blog as today I am hosting Carnival of the Green, a weekly linkfest from Treehugger which travels from blog to blog, with each weeks’ host choosing the best of submitted links to discuss and feature each Monday. There has been no Carnival for two weeks over the holiday period with the last being hosted at Great Green Gadgets, and so the pressure is on with dozens of links and a brand new year to celebrate and promote being green. As part of a range of green transport links I’ll focus on to begin with, totally on theme and early in is Joe from Green Living Online, who gives a basic round up of ebikes for getting around college in style – the big man on campus is anything with two-wheels. Students who have clued into the fact that most travel is local are turning to a variety of plugged-in options. Of course, to power your ebike you want to use renewable energy. Go Greener, Australia has an interview with Eloise Dorch, who recently campaigned against a price rise for renewable energy in Western Australia, where the sole power retailer has a monopoly and consumers cannot choose different companies as they can in the Eastern States. It’s a travesty that coal powered electricity is still being subsidised and making it harder for those with tight budgets to chose green power, and Eloise outlines her experiences in protesting this issue. And while the temperature here in Oz is scorching, on the other side of the planet things are pretty cold! Mike from Hybrid Car Review gives some info and advice about how cold weather affects hybrid cars. 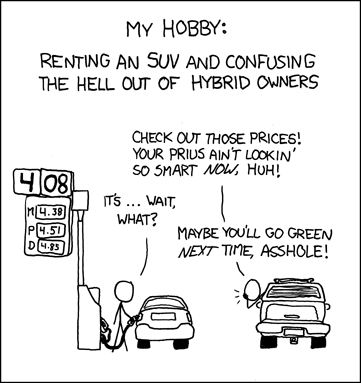 Nice to note that hybrid sales are powering ahead and the Prius was one of the top 10 cars in the US in 2007 – that’s not just hybrids, that’s all new car sales – awesome. And while you’re feeling chilly, or even just in need of a good excuse to reduce your power bills, Brave New Leaf has some simple easy to follow tips to improve your hot water heating efficiency. And while most of us know we need to reduce our carbon emissions from travel – Veggie Revolution brings us a brief overview of Carbon Offsets to neutralise air travel and Susan J presents carbon friendly travel options with her Environmental Guide to San Francisco posted at Go San Francisco Travel Blog. On to recycling. Stephanie presents a frugal and cool idea: Using Scraps of Wrapping Paper, posted at Stop the Ride! and Cindy of myrecycledbags.com has a new design for a recycled knitted plastic bag doormat. Adam at lifegoggles blogs about a very funky recycled can opener, and Green Deals Daily alerts us to a recycled and recyclable plastic tumbler which is more attractive than many I’ve seen in the same price range and style. Last but not least, Adam from lifegoggles also submitted a blog post I rather enjoyed which is a bit of a catch-all, with fun green roundup #7: a humorous look at the best of Treehugger. A diverse range of links but the minimally lit billboard is my favourite for sure. That’s all for Carnival of the Green today. Look out for next week’s at American Inventor Spot! This blog isn’t dead, it’s resting! Just a quick note to let you know I aint’nt dead! The eBike lifestyle was on hold for a little while as I moved my base for the time being from Perth to Melbourne! The great thing about Melbourne is that it’s a very cycle friendly city, and so far I’ve just been walking everywhere – soon that is about to change as my partner joins me here in early January, and we will have eBikes as our sole method of transportation. Look for posts to come in the very near future about great eBike rides around Melbourne. I’m really looking forward to getting back into the saddle again! I will also be hosting Carnival of the Green as the first host in 2008, which I knew was coming up but the submissions are now coming in so I am gearing up to get the blog active again after this quiet time. Any posts or issues you’d be interested in me featuring, especially in eBike and transportation news, let me know!